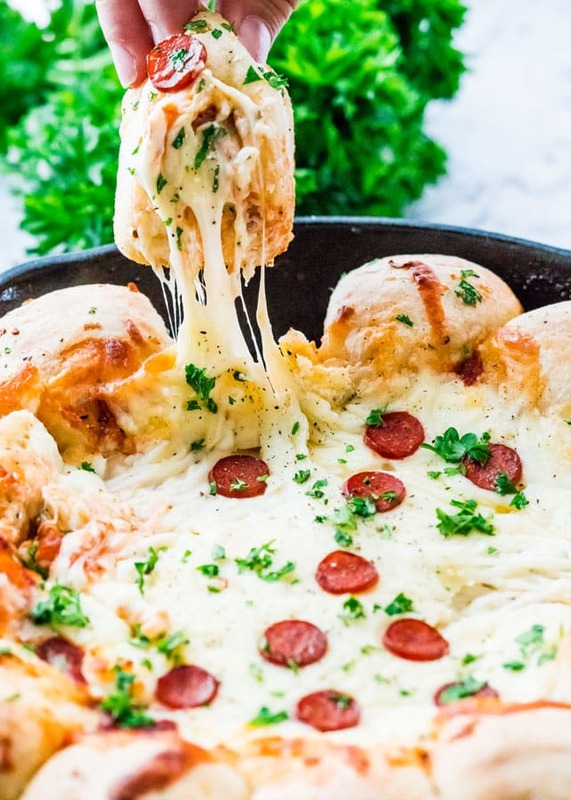 This Skillet Pizza Dip is extra cheesy, creamy and the perfect appetizer or snack. Perfect for those times when you’re craving pizza but want something a bit different. Let’s be serious here for just a moment. Who doesn’t like pizza? I honestly have never met anyone in my life, ever, who didn’t like a good pizza just oozing with cheese! I’m sure most of us, if not all of us, even have weekly pizza cravings. So for those times when you’re craving a good old pizza, I’ve got something a bit different for you. Same familiar flavors but as a dip which will just blow your mind because if you’re like me, you probably love the cheese most of all when it comes to pizza, and this dip is just about the cheese. 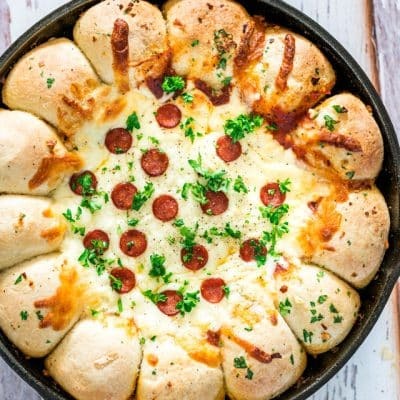 And just because you do need something to dip in this awesome pizza dip, I used frozen bread rolls which are so easy to use, just grab them frozen from the bag and dip them in the garlic butter mixture, then arrange them around the edge of the skillet. This cheesy dip is, how shall I put this, loaded with cheese, 3 different kinds of cheeses that is. We’re talking cream cheese, Parmesan cheese and lots and lots of Mozzarella cheese. I did tell you this dip is just about the cheese, didn’t I? But of course it wouldn’t be pizza dip without the pizza sauce, so in between those layers of that cheesy dip, I added some pizza sauce as well. Which is why I mean it when I say that this will truly taste like pizza. 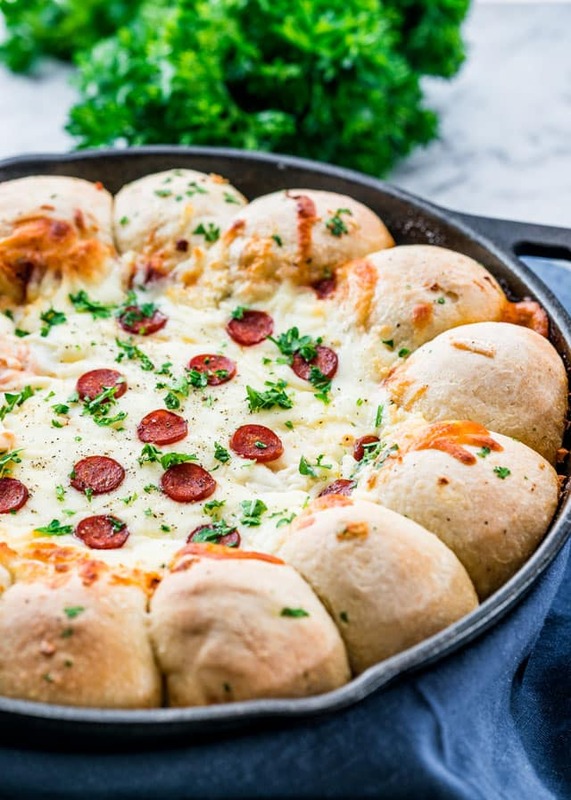 You can top this dip with your favorite toppings, however, I decided to go with a basic pepperoni pizza dip here, so my only topping was a turkey pepperoni stick which I cut into thin slices and decorated the top of my dip with, just enough so that it looks like a pizza. I’m normally not a double dipper, but in this case I almost think double dipping is required. Either that or if you want to be more classy, go grab a fork and use a fork to dip a second or third time, but I never said I was a classy lady! 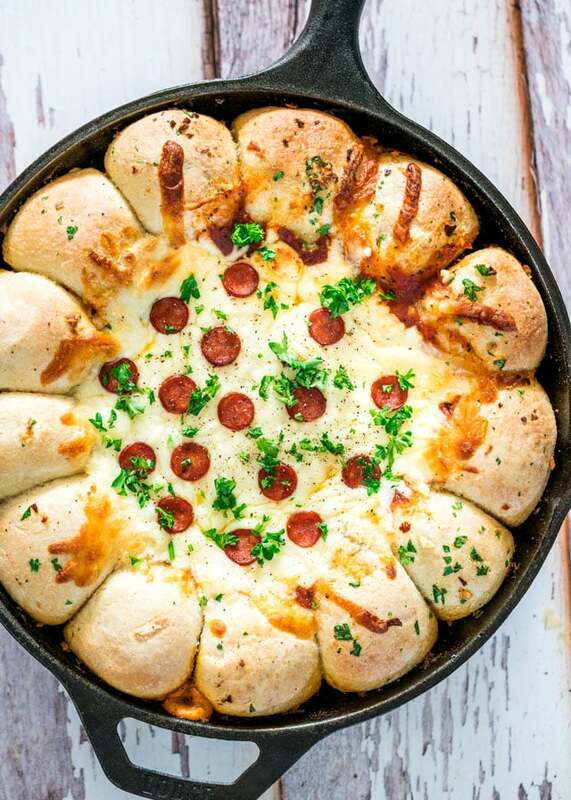 If I was, I probably wouldn’t be giving you a pizza dip recipe! HA! I absolutely love skillet dips! They always look and taste amazing. If you love this recipe, try my Skillet Pull Apart Bread with Spinach and Artichoke Dip. Now I know you want to try some of this, so what are you still doing here, off you go, run to the kitchen and make some dip! 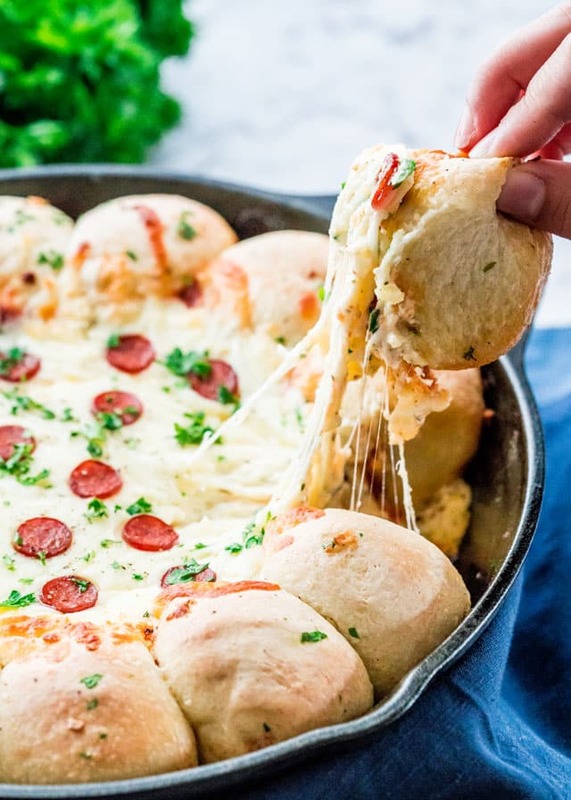 This Skillet Pizza Dip is extra cheesy, creamy and the perfect appetizer or snack. Perfect for those times when you're craving pizza but want something a bit different. Preheat your oven to 400 F degrees. Spray a large skillet with cooking spray, if required. At this time you can take out the frozen dinner rolls from the freezer, they do not need to be thawed out. Whisk together the butter, garlic, parsley, red pepper flakes, salt and pepper in a small bowl. Roll the frozen bread rolls through the butter mixture then arrange them around the outside of the edge of the skillet. Cover with a clean tea towel and let the bread rolls thaw out for about 20 minutes. In the meantime, in a medium size bowl add the cream cheese, mayonnaise, Italian seasoning, red pepper flakes, salt, pepper, Parmesan cheese and mix well using a spatula until everything is well combined. Add about 1 1/2 cups of the Mozzarella cheese to the mixture and mix to combine. Spoon about half of the cheese mixture into the center of the skillet and spread it. Add the pizza sauce and spread it over the cheese mixture then spoon the rest of the cheese mixture. Sprinkle with the remaining half cup of mozzarella cheese then top with the pepperoni slices. 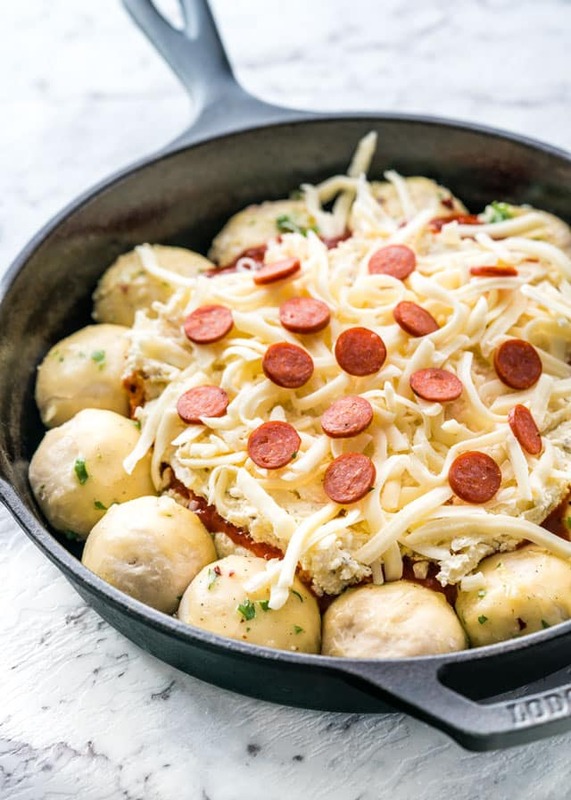 Place the skillet in the oven and bake for 20 to 25 minutes or until the bread rolls are baked and golden brown and the pizza dip is hot and bubbly. My frozen dinner rolls came 12 in a bag, so I used a whole bag for this recipe, but some bags may contain 20 rolls. In that case, just freeze the remainder, or bake as instructed. I used whipped cream cheese to avoid having to mix the cream cheese with a mixer, but if you cannot find it or just have the blocks of cream cheese, make sure you leave it at room temperature for about 15 minutes, it will be easier to mix with a mixer. #1 I cannot stand it. IN A GOOD WAY. In an “I need it” way. #4 looks delicious and thank you for sharing! Perfect timing. I gather with friends to watch the Seahawk games. Enjoying a football began VERY late in life I most admit—kind of a big surprise. I got pulled in by the potluck part of the activity and it grew from there. Anyway my point is I have started already thinking about some fun items to contribute. This recipe is definitely a touch down. Lol. Thanx for the suggestion! My pleasure, hope you try it! Nice to hear from you again!